Topic: Is my AFM bad? 1989 22RE, just finished the timing chain (and accessory) replacement, and can;t get the truck to turn over. I checked and rechecked everything, all connections were good. I realized the fuel pump was suspiciously quiet, and that the truck wasn't turning it on. I shorted it using the test block, and the FP came on fine. I shorted the connector into the AFM, and the FP when on when they key was turned. Is there something I am doing wrong, or is the AFM busted? Re: Is my AFM bad? Is the ground strap at the intake joint under the upper manifold connected? Won't even burp without it, goes on the center bolt. Good call. I checked all grounds with my multimeter, and they were all continuous, and under 3 ohms, so those should be good. Here's a video of it trying to turn over. 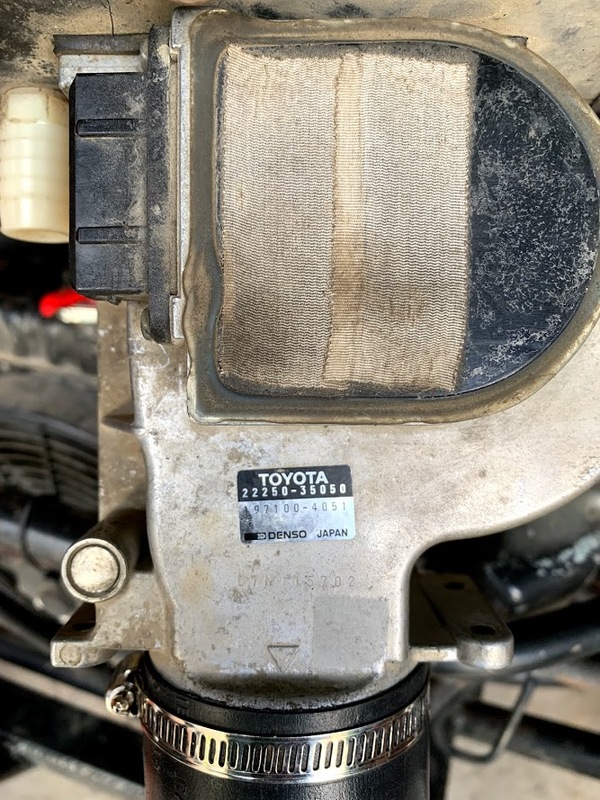 Was your afm connected to a 90° elbow off the throttle body facing straight down before all this maintenance? That’s what I’m seeing in the video you posted. You’re fighting gravity. The afm flap/door isn’t able to open. It should still fire momentarily from the CSI. when you open the flap with key on, the pump should run. Yes it was, but I was always confused by this configuration. The AFM that came with the truck was broken during tear down (undoing the screws for the connector and pulling wasn't the best way to remove the connector....super helpful friends...) so this one has never run on the truck before. Would it help to diagnose if i had it going horizontal instead of vertical and try to start up that way? OK, so you're suggesting I manually open the flap when starting to verify the circuit? Key on, finger flap. Pump should run. Jackpot. I removed the 90* elbow, and ran the AFM detached from the TB. I could hear the pump go on once the plate was depressed. Props to your fine-tuned ears. I ordered a spark plug tester light, and it shows no spark to the plugs. I've never dealt with an electrical system like this, so I assume I need to figure out if the coil is producing voltage to the distributor and then go from there, right? Can I plug the spark plug tester into the inlet of the distributor for that or if there a different test that would be better? Since the issue all occurred after the T-chain removal/replacement, I would start with the basics, recheck all wires, fuses, connections, etc., timing, then go on from there. Page created in 0.945 seconds with 27 queries.